The most satisfying part of repainting; applying the decal on the paper table! With another few applications of Micro-Sol, the boundary of the decal sheet should become less obvious. 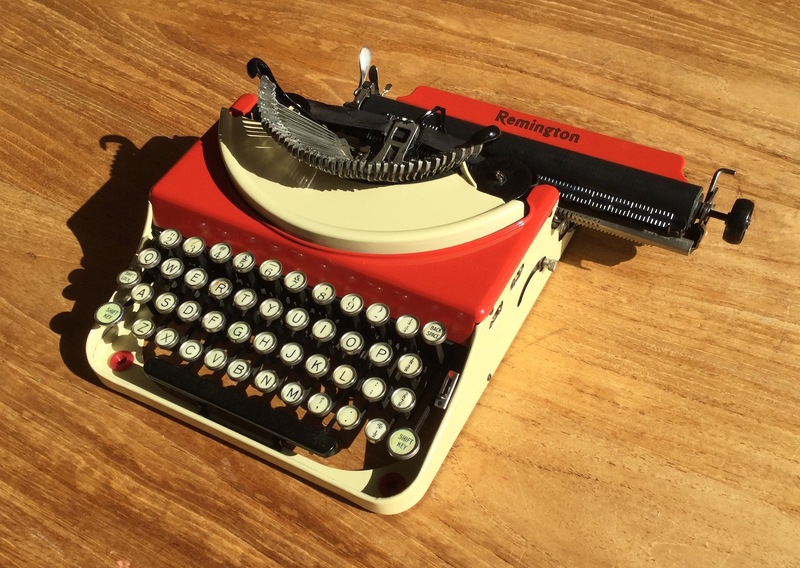 The 'Remington' decal was made the same way as before - printed on transparent waterslide transfer sheet in reverse. Carefully fill the black-rimmed letters with gold paint. Then apply the right-way-up, having first used a bit of blank transfer sheet to get the gum/glue on the paper table for adhesion. Was aiming for Remington Portable color No. 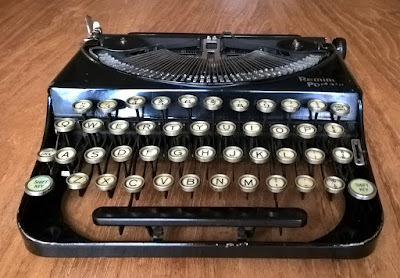 17 (Tan and Pompeiian Red) as shown on the The Classic Typewriter Page (i.e. the definitive source for anything pre-war portable from Remington). Turned out more an ivory than tan, but overall quite a credible looking typewriter with these colors. 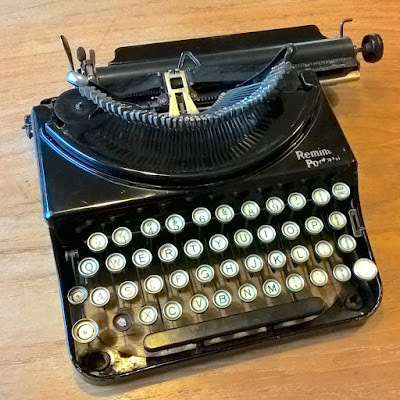 Now that the 'wreck' Remington Portable typewriter has come this far, the next step was to take it apart again. Or rather, to take off all the bodywork. 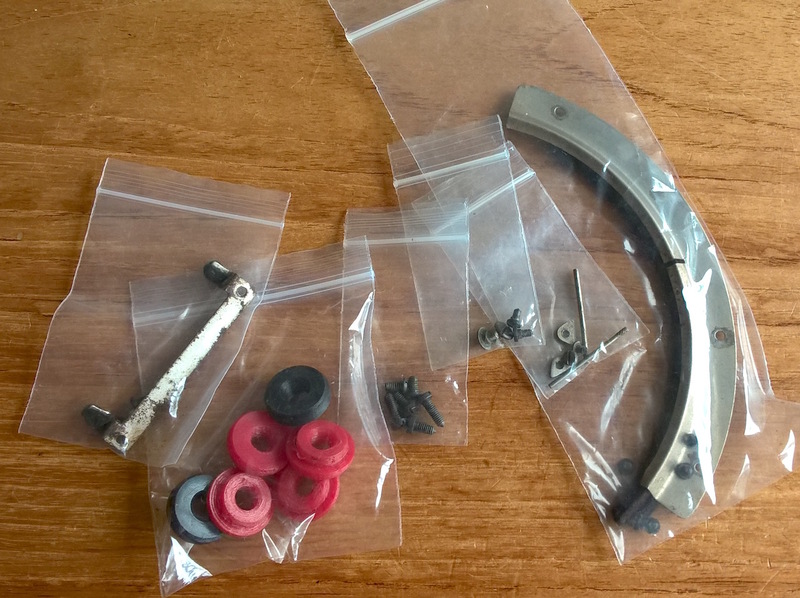 And all the various mounting screws, rods and sundry parts bagged. Keeping these in a little bag per panel or part to mount should prevent trouble later on. Later a new felt strip will be made for the lifting tray, but first the body-panels were going to be stripped down for a re-paint. 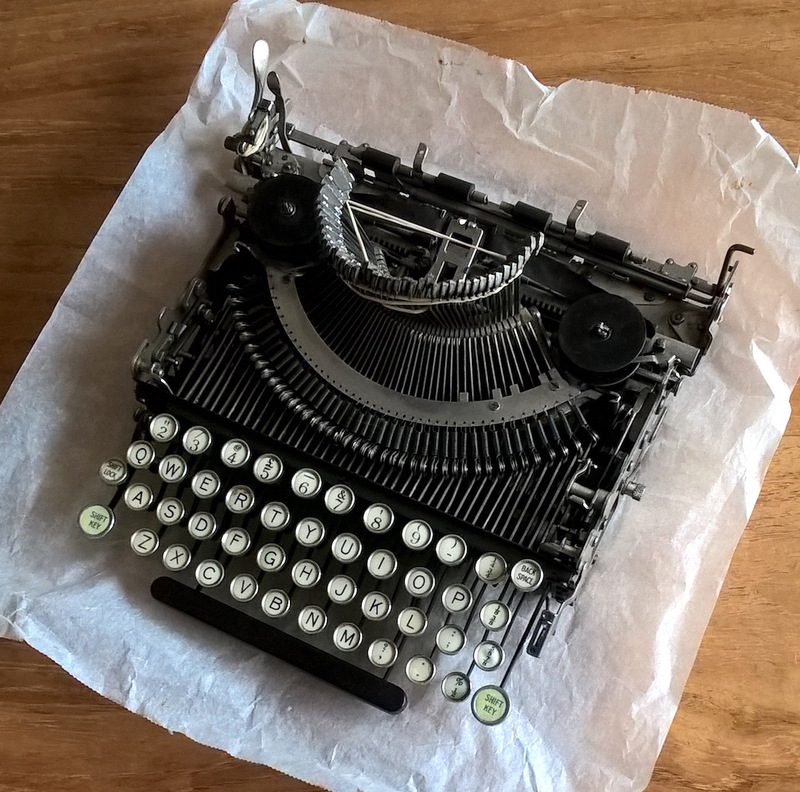 Stripping the old lacquer of a typewriter can be done in many ways I suppose. 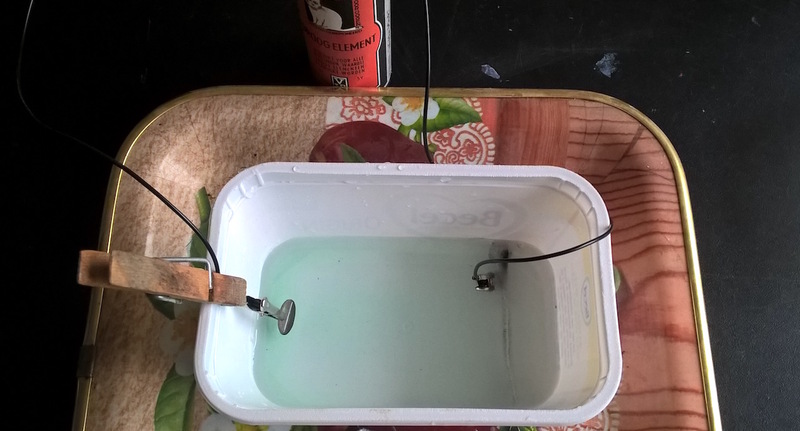 What worked reasonably so far is lye (drain cleaner) or alternatively acetone. Either way, the key ingredient is time. A bottle of lye is a cheap and reasonably easy way to remove or at least weaken the old lacquer, when handled with care. 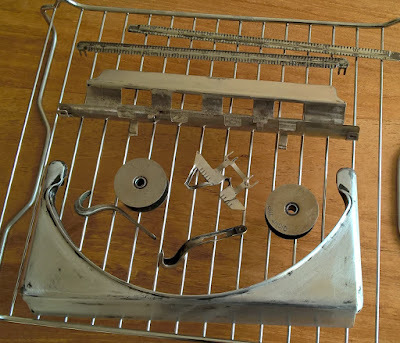 The steel parts were placed in a shallow bath of drain cleaner in a stainless steel container (a roasting pan). Almost immediately the black paint starts to give off. It will however take a few hours for the paint to have softened enough so that it can be brushed off. Warmth also helps a lot - leaving it in the sun for a while, covered with a lid, is a good plan to speed things up. When using lye, it is of course important to not get any of it on yourself (or anywhere else, for that matter). It is rather dangerous stuff. Protective clothing (no bare arms, etc) and gloves can be a good idea. The parts in this case were handled with pliers and a large bowl or basin with water was placed next to the lye bath. When the paint looks like it is crumpled and bits of paint start to drop away, the part was lifted out of the lye with the pliers and placed in the water. This dilutes the remaining lye clinging to the part so that the part can be handled for rinsing and scrubbing. Some paint will stay on the part, but generally is softened so that it can be sanded down smooth. 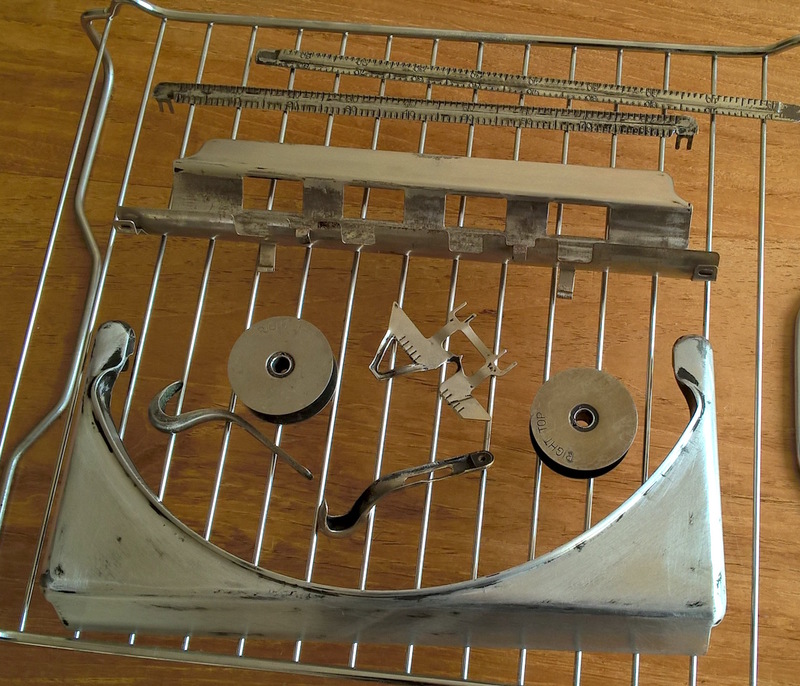 One other very important thing is to use the lye method only with the steel parts and not with aluminium. Aluminium would react badly with the strong alkaline. 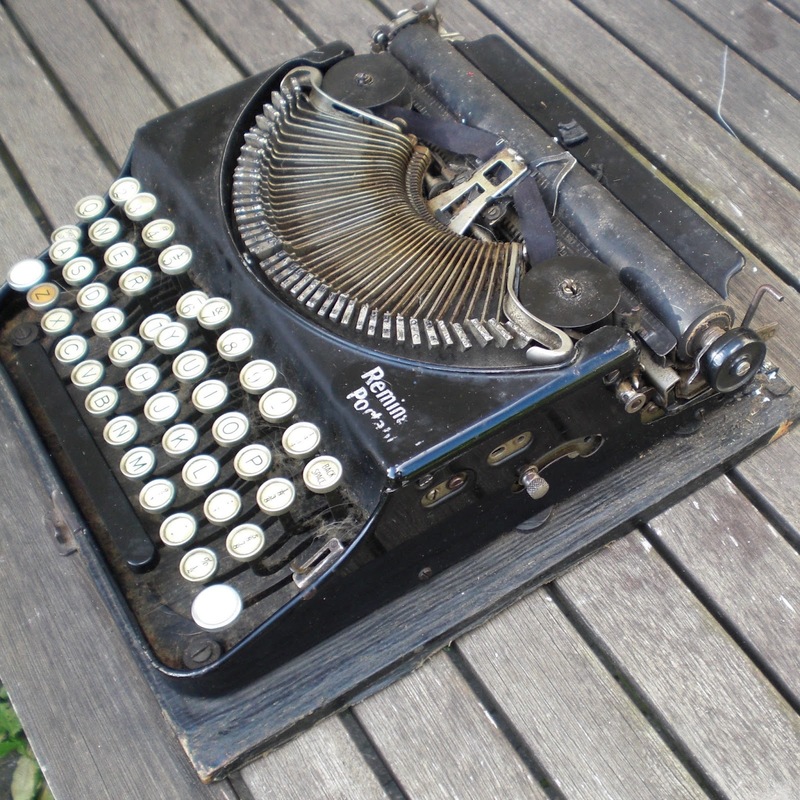 (The Internet has videos...) The top-cover panel of the Remington Portable is an aluminium casting. The part would probably not survive a dip in lye very well. For that reason, the top-cover was placed in a shallow bath of acetone (in another, old roasting pan) and covered with a plastic bag. Without enclosing the bath, the acetone would evaporate very quickly and not have any effect on the lacquer at all. With some addition scrubbing and sanding (fine grit sandpaper as well as steel-wool pads), the first batch of parts were prepared for painting. 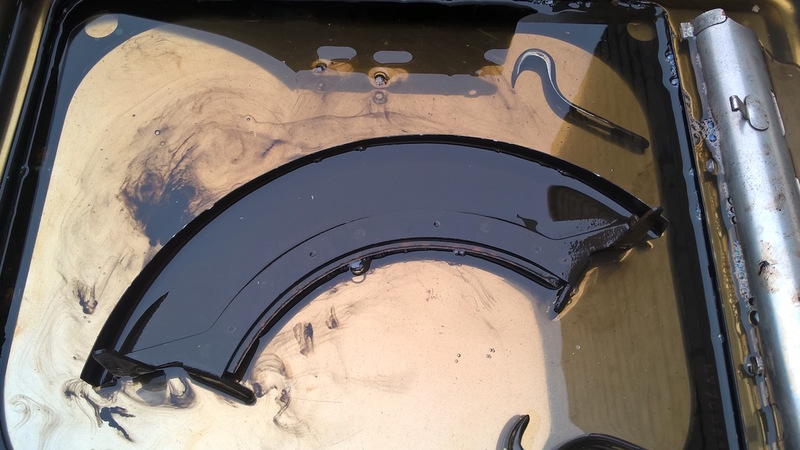 After cleaning the parts were dried quickly to limit any rust forming. They were then quickly given a coat or two of grey metal-primer with a very light sanding between coats. Small painting detail of the underside of the paper tray - distinct fingerprints. Somebody in the London factory of the Remington company had some of that black paint on their hands when they handled this part as it was lacquered, back in 1927. Some sanding to do still on that outer frame, then to look for paint. Colours! Now that it's 'underhand' again, keep going with some next steps in the refurbishment. 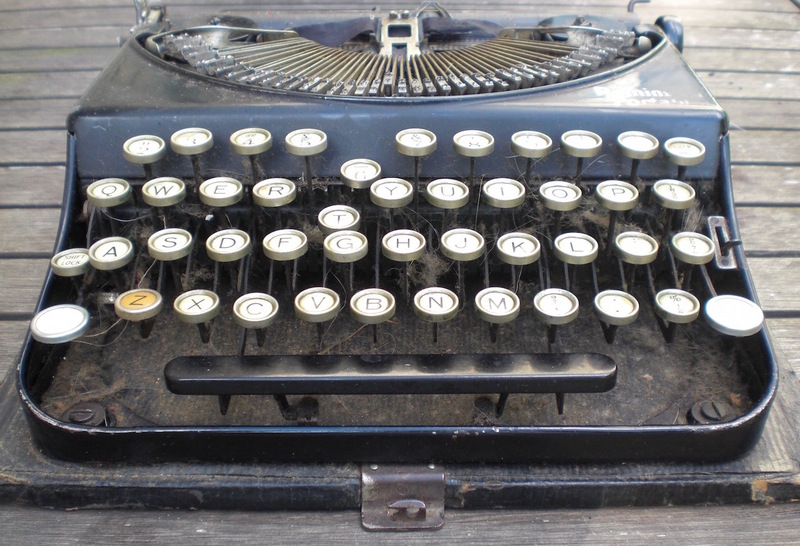 From a photograph of these keys, a set of little labels was quickly printed and fitted to the keyboard. When properly editing the pictures for the actual repair, i.e. cleaning-up and paying attention to colour matching, then this method should work very well to make the keys blend in. 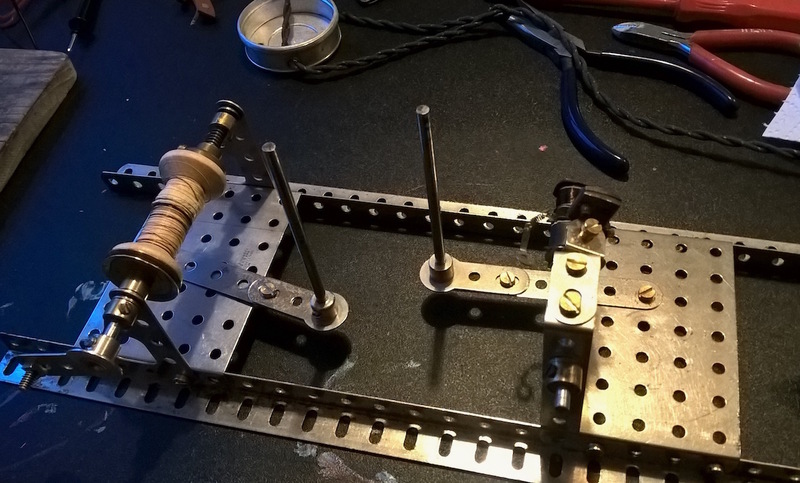 With the nickel-plating kit out, also the carriage-lever was given a treatment. This had lost most of its plating. Also thoroughly scoured and polished; clean yet it does show the plate-loss. 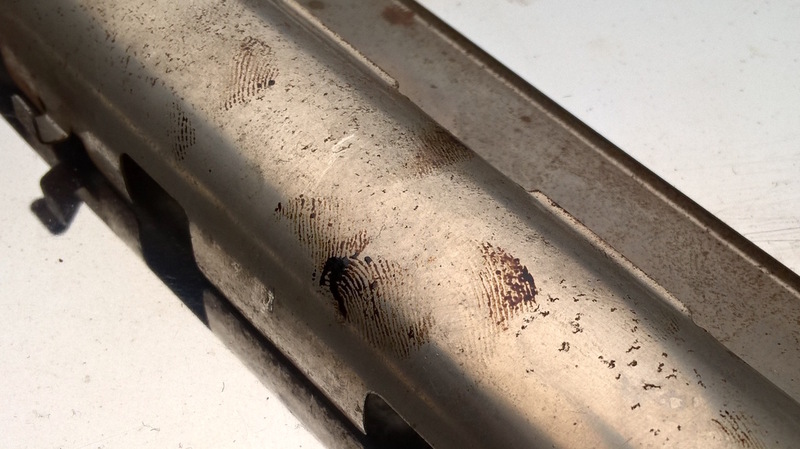 Result is indeed a shinier carriage handle. The plating seems to accentuate the uneven surface of the part. 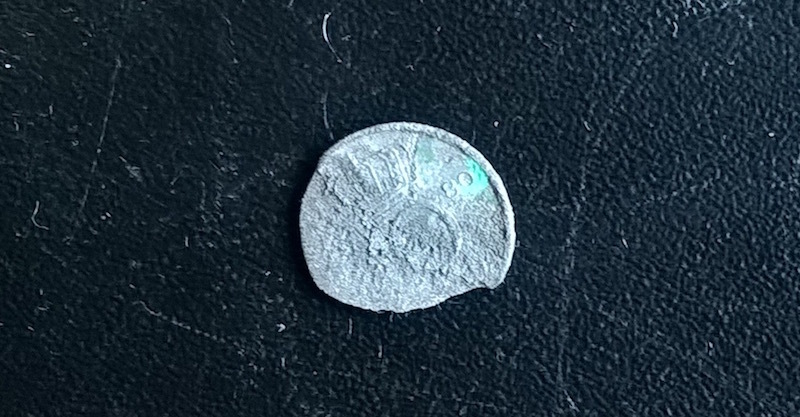 Perhaps because of differences in growth speed on the old nickel and the underlying casting, but scars and marks are more noticeable now than before. Nevertheless, it is nickel again all over. 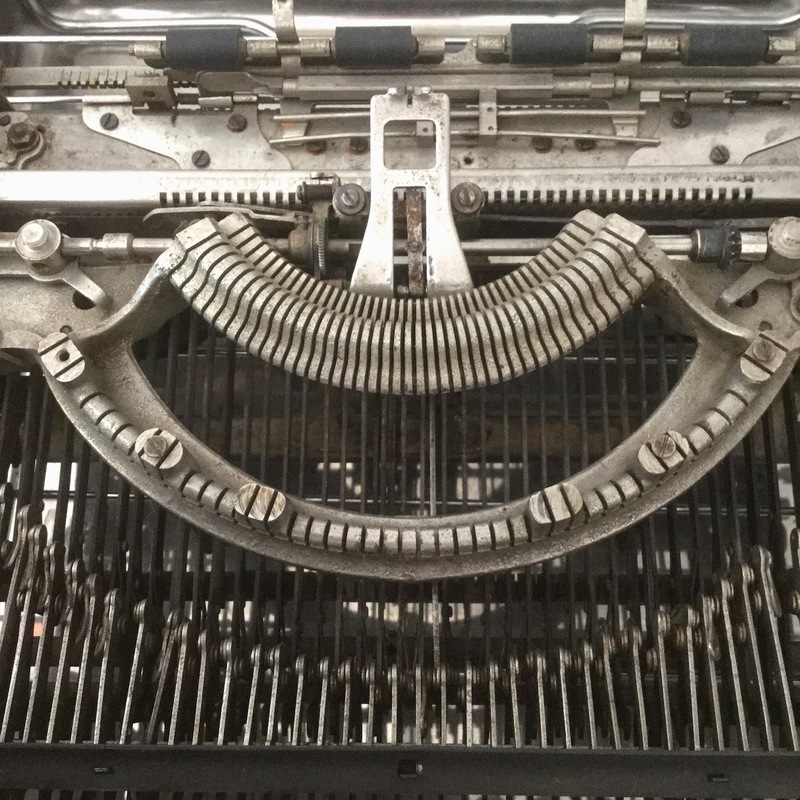 Remounted on the machine, together with a better specimen of the line-release lever and some polishing, the typewriter it is starting to look like a machine that could be worked with again. It was always going to be a slow project, but with a nearly two-year hiatus it's a very slow project indeed. Anyways - the machine when bought did not work at all - it was gummed solid with broken linkages, missing parts, and looked like this. The following year it was given a very deep clean, down to the bare chassis. During the cleaning I made the mistake of leaving it in the fluid a bit too long and not drying quickly enough, and so unfortunately introduced more rust. Blackening of screws does give some corrosion-protection, but not much. After cleaning away most of that new rust, linkages were fixed and the main assembly put together again. After all that hassle the key-lever for the '6' still refused to align. I must admit this combined with the now rusty black screws discouraged me somewhat and the whole project was shelved. The machine had received a replacement stop-block for the uppercase alignment out of the spares-box and the carriage stops were aligned. Started to place the uppercase neatly centred on the platen. Then tweaking the lowercase to match the uppercase. With the top-cover off, the lifting tray was inspected more closely. Comparing with another Portable #2 confirmed that the lifting guides were 'off', looked to have been bent sideways and forward. This machine really must have been mistreated - broken linkages of course already indicated it had been handled 'inexpertly'. 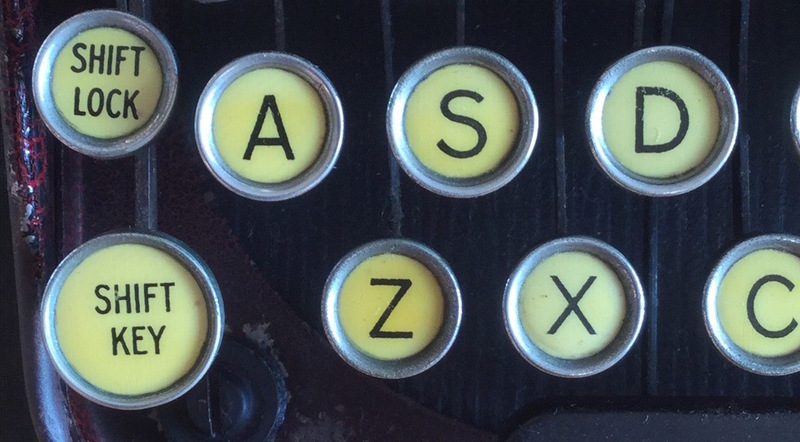 The left shift keys and the 'z' key still need to be re-mounted with proper lettering. 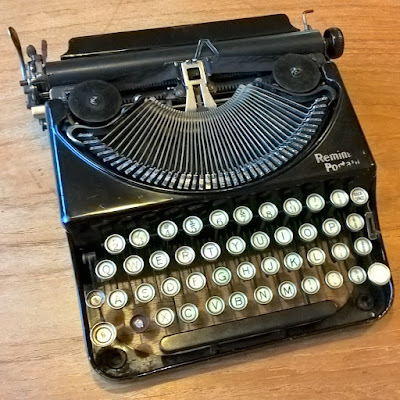 The whole keyboard could benefit from a re-fit, though that would require some special tools ideally. 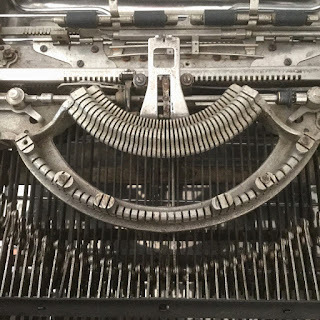 The top row of keys show an odd wave, as if somebody tried to lift the machine by the keys (maybe somebody did just do that...). Having gotten this far, will now have to see how to finish the machine. 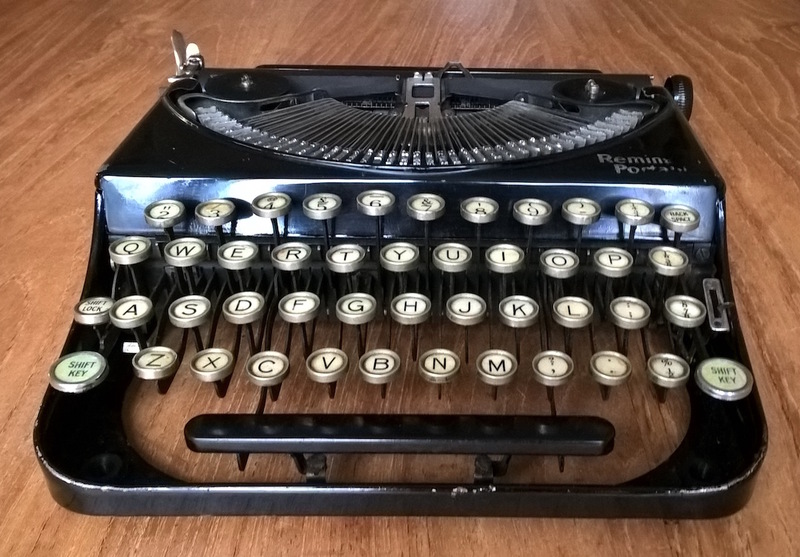 Depends a bit on how the keyboard comes out (the shifts have non-Remington keyrings, regrettably), it is going to be either a re-paint or kept in its current 'industrial' look. 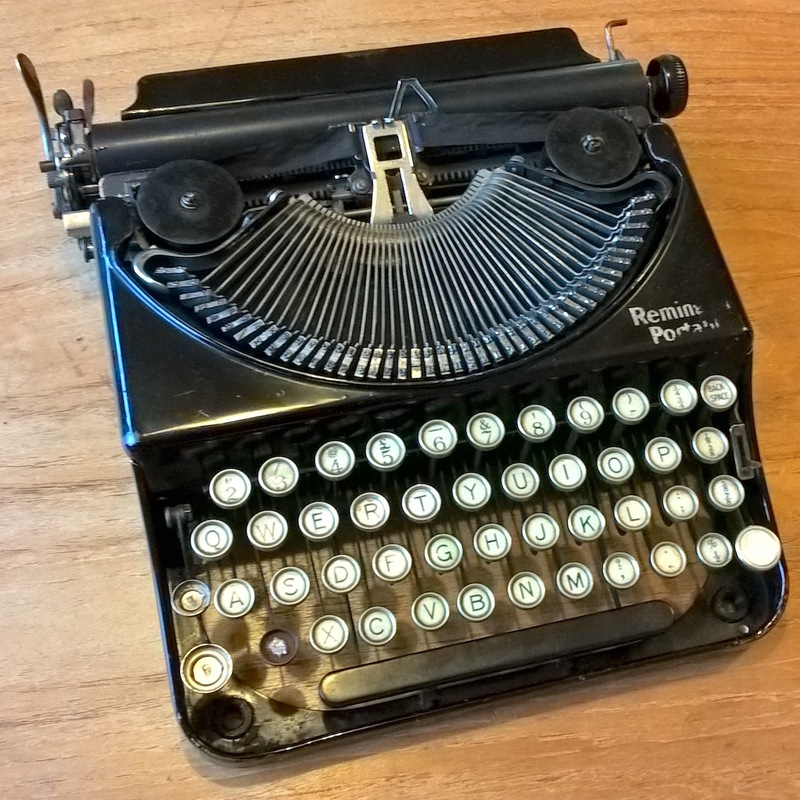 Conclusion of it all is (again) that these Remington Portable #2 typewriters are very sturdy and resilient machines! 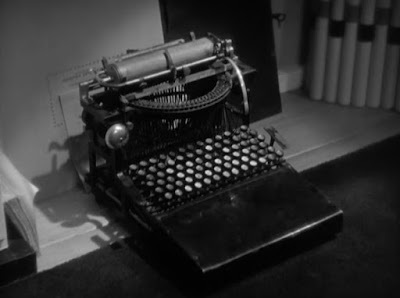 Was that an American Caligraph 2 typewriter? 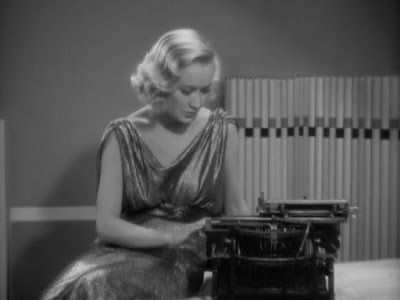 In a light and (then) slightly risqué comedy film, released in 1933, one of the main characters is a playwright who uses a typewriter. 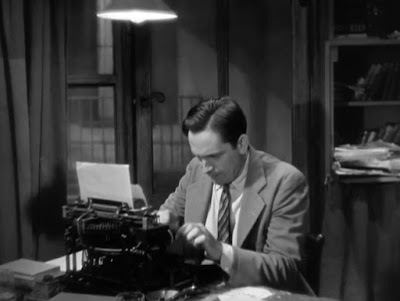 Perhaps to illustrate the unconventional, bohemian atmosphere he's not using a 'normal', contemporary machine, but an ancient upstrike typewriter. 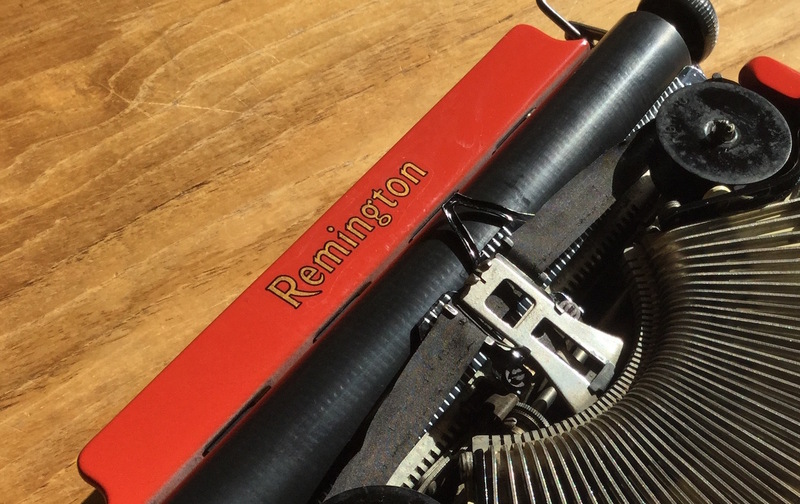 This typewriter even gets a good close-up. The machine doesn't have any recognisable decals, but it looks a lot like an American Caligraph 2 that would probably date from the 1880s. 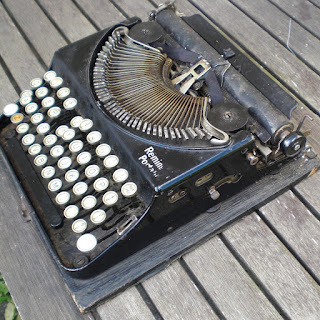 Even back then this would have been a fifty year old typewriter. Decidedly quaint looking, both for today and for a 1933 viewer. So a small factual error; as can be seen from the impressive amount of keys, this is a full keyboard typewriter - so would not have a shift. 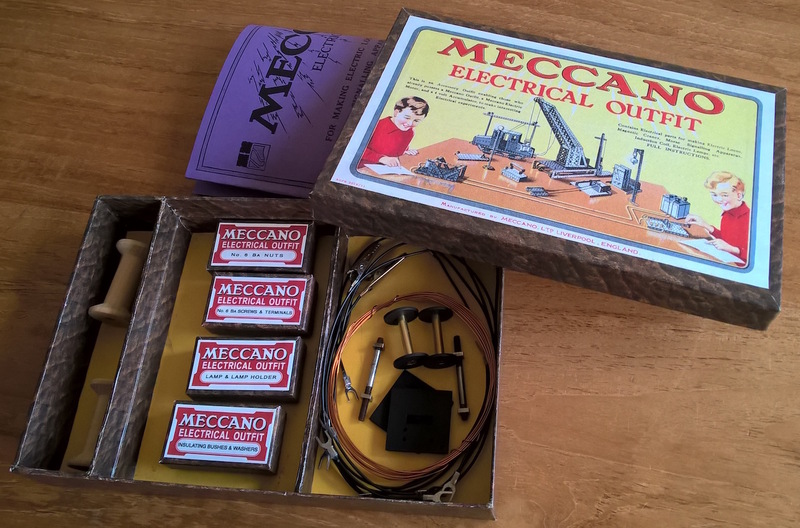 An electric accessory outfit for use with a Meccano set was introduced in 1920 by Meccano - to introduce to boys the miracle of electricity. The included manual explains that electricity plays a tremendous part in every-day life as "the wonderful power" that enables such things as electric light, electric trains, telephone and telegraph. It goes on to explain that even though "no one yet has been able to define it or tell just what it is", it is an amazing natural force "capable of unlimited uses". The original 1920s Electrical Outfits were quite expensive back then, and are rare and expensive today still. So to experience today a bit of this wonder of 1920s advanced technology, a reproduction set was made. Complete with a reproduction box, manual and parts (the printing codes having been altered to clearly state it is a reproduction). The very informative primer at the NZMeccano galleries provided enough information to enable a decent repro to be made. The parts are quite simple, but still opened up the then new world of electricity. Still have to complete the set with correct-pattern wooden spools and some cotton-covered wire, but already something can be built with it. The parts being new, there are no issues with them being rare or fragile. 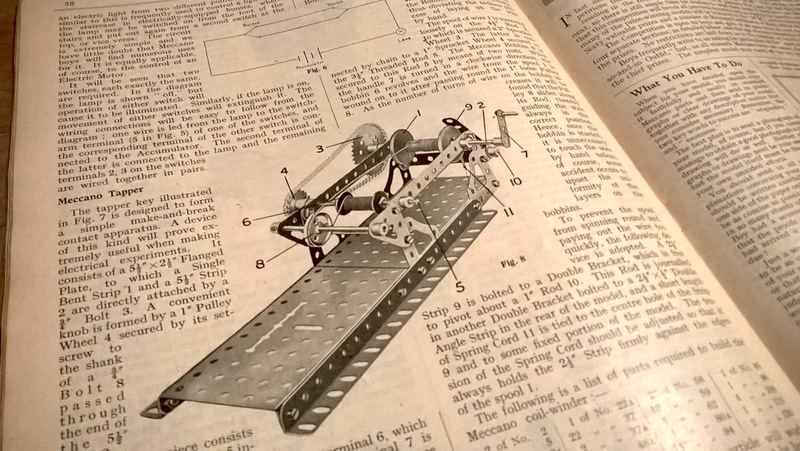 Browsing the January (1928) issue of the Meccano Magazine, there's an article with an improved design coil-winder. 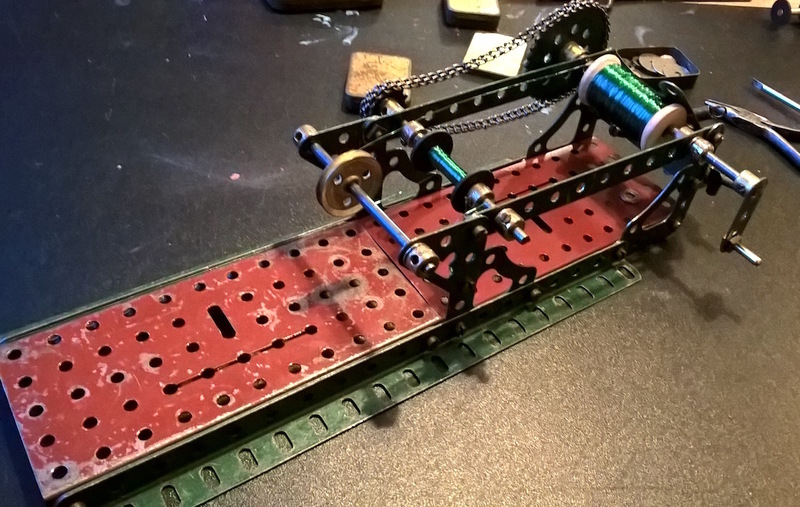 Using Meccano from the same era this was put together; winding a little coil on bobbin (part 301) using some lacquered magnet wire. Not paying too much attention to the amount of turns, but just made sure that the overall resistance was not too low - the coil turned out at approximately 8 Ohms, so should be fine with a battery and also fine with a USB power-bank. 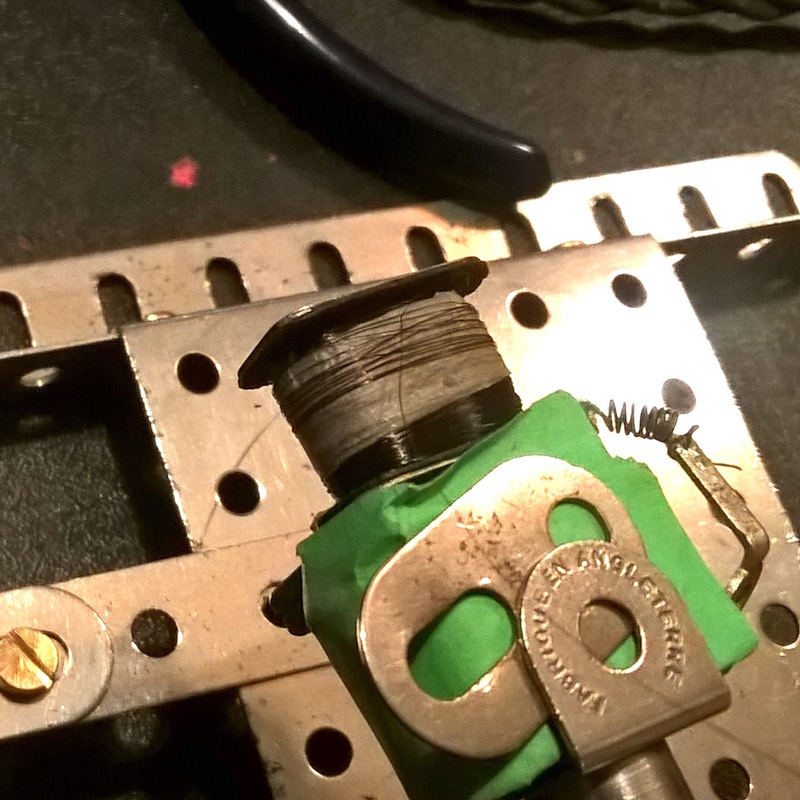 With the soft-iron pole-piece (part 308) it makes a good electric-magnet, with a short rod it's a working solenoid. The model No. 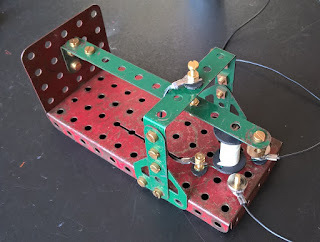 8 in the instruction booklet is a combination of a buzzer and a tapper-key to create a small morse telegraph setup. All workings can be seen and understood - and it works too! The buzzer can be tuned with the contact-screws and the moving strip. In this case a bit of extra weight was added at the end to lower the buzzing-frequency. The corroding effect of the making-breaking of contact does illustrate the usefulness of the special silver-tipped contact-screws part 307 - still have to create some of those. Hands-on very basic electrics, but even something as mundane as an electric doorbell buzzer once was new and the very height of technology. Venturing into a new domain with 2000 Ohm resistance per phone. Something new to discover in the area of vintage 20th century technology. These headphones date from the 1920s - with their very high impedance of 4000 Ohm in total they're meant to be used with a radio of the period. Most likely a crystal wireless set, or perhaps even an early (expensive!) valve radio. This particular set of headphones survived what are probably decades of disuse in good shape with the nice leather-covered headband fine too. The metal parts clean up nicely, with the odd bend gently worked out. The earcups are probably not bakelite, but hard rubber. Molded on the inside is the Ericsson wordmark - so these are Ericsson headphones (or at least a make that used phone speakers made by Ericsson). Nevertheless when they arrived, the phones were broken. This is easily tested by tapping the leads on a battery - the DC pop and crackle of even a 1.5V AA cell will be clearly audible. These headphones however remained completely silent. Open circuit somewhere. From a browse-around on the web, it becomes clear that these can often have some broken connections - generally where different gauges wire have been spliced together. 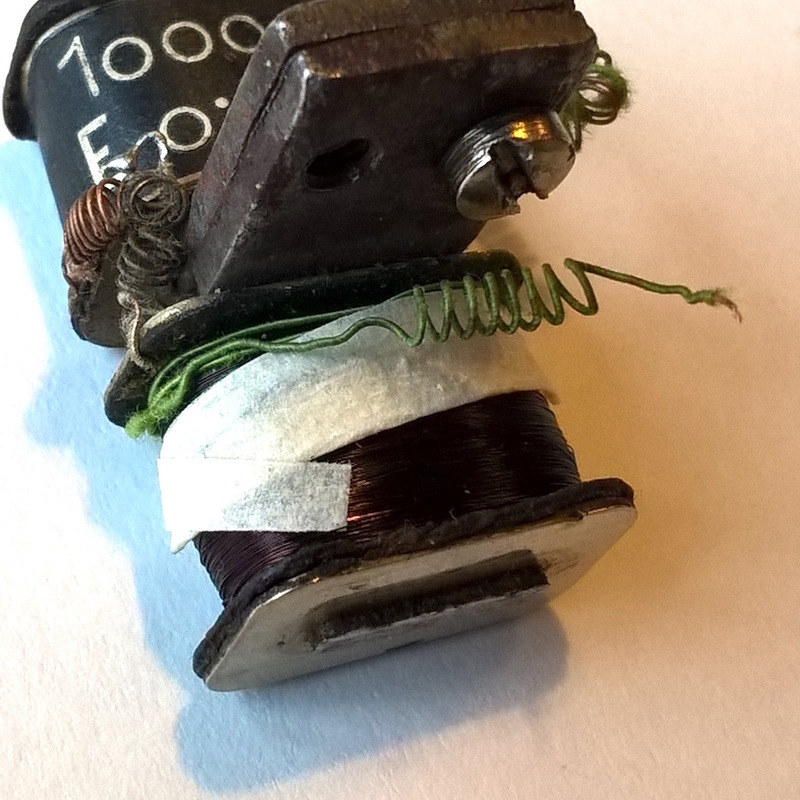 Also from that browse-around, some instances where the insides get replaced by modern (cheap) drivers - sometimes not even soldered in place, but a gash sawed in the cups (<gasp>!) to get the wire through. 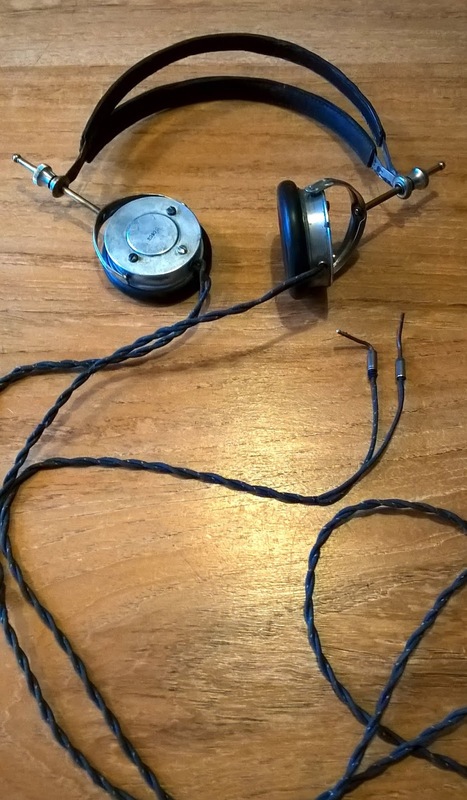 What also is clear from some reading up, is that this type of headphones can usually be repaired - like much of the technology of the period, it should last. 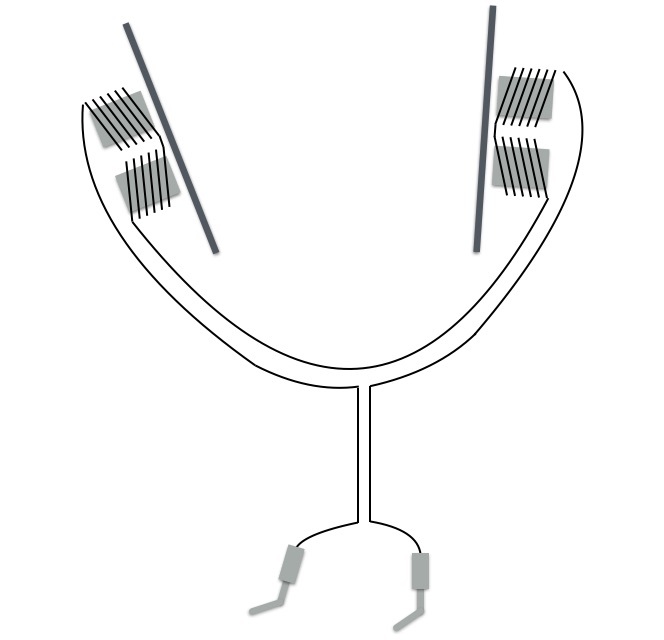 Internally, the headphones have four 1000 Ohm coils all in series. By unscrewing the earcups - these come off easily - the iron diaphragms with their gasket-ring come off to give access to the inside. 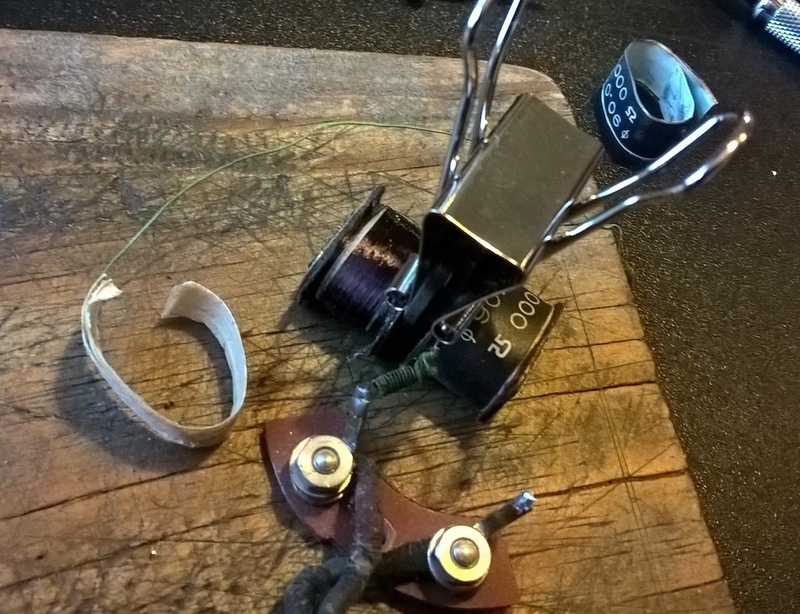 Methodically measuring the resistance from point-to-point, the defective coil was easily identified. Undoing the screws that hold the assembly of coils and magnet in the aluminium cup, the set of coils with the defective one was taken out for closer inspection. Clipped together to not break the connection between the pair, the paper wrapper can be gently peeled off. Luckily after only a few meters of unwinding, another paper-tape starts to appear. 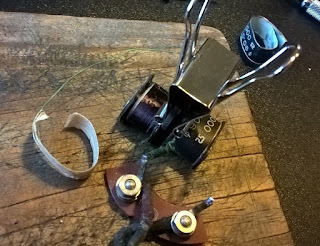 The wire for this coil was apparently spliced halfway winding. Probably during manufacture, when one spool ran out and another was placed onto the machine. 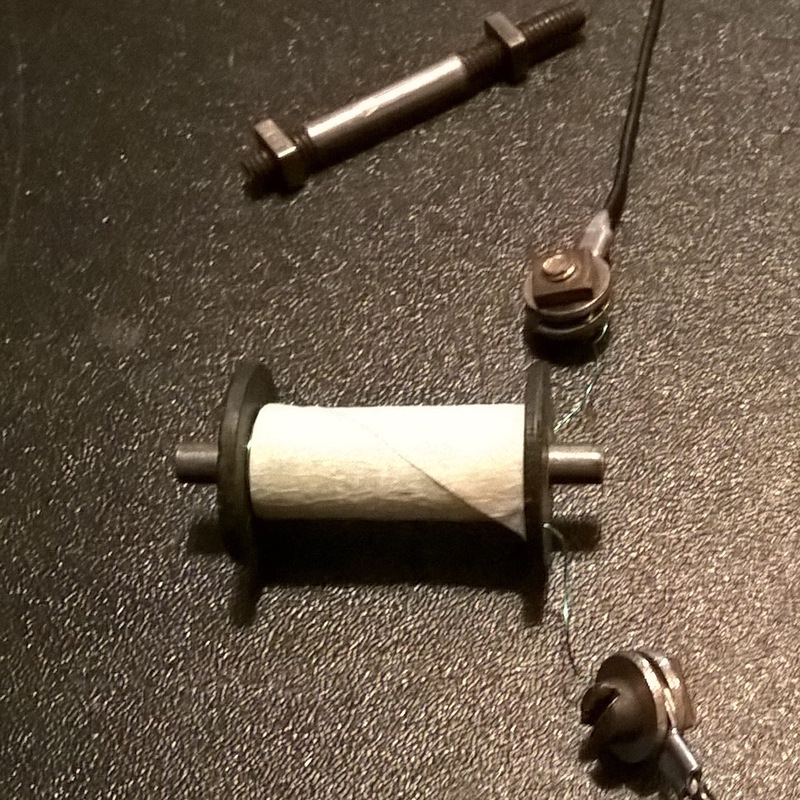 When gently peeling off this paper tape, the wire-end just fell out. 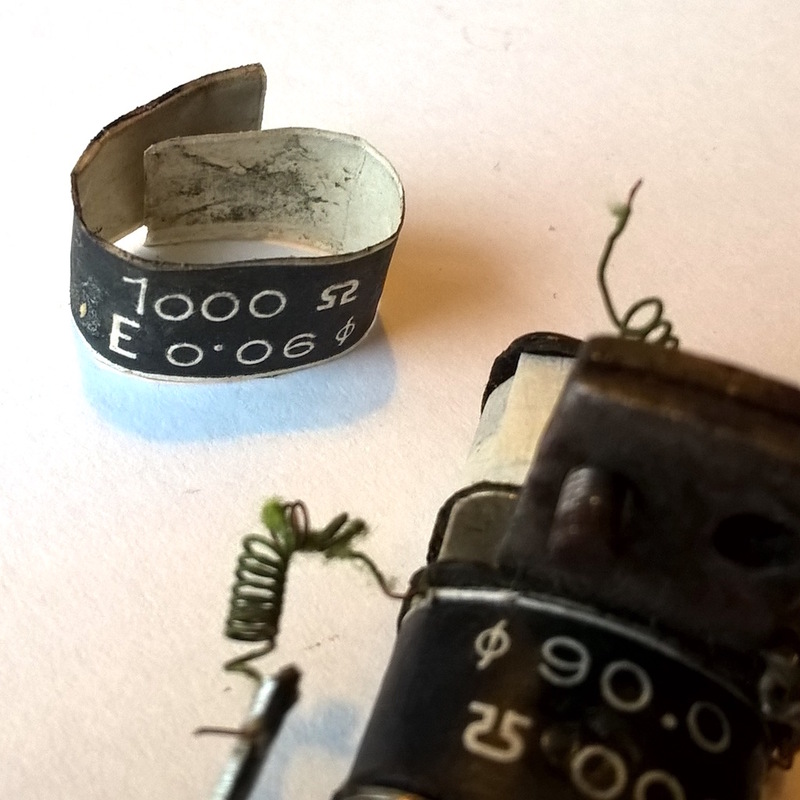 This very likely was the original break - some checking up with the multi-meter confirmed that the rest of the coil-windings were fine. Gentle rub with fine-grit sandpaper to remove the lacquer, then twist the ends together. 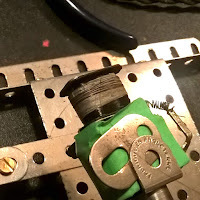 To make sure, a small drop of solder to keep it all tight, then a new paper (masking) tape to hold the connection safe. The paper-tape holding the new splice is then wrapped around the coil and the rest is re-wound too. The thicker lead-wire is spliced on in the same manner, wrapped around and held in place with a small extra bit of paper-tape. And thus a fixed coil. A little spot of paper-glue and the original wrapper is placed back too. 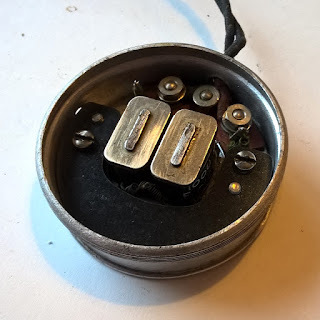 The lead-wires are then soldered back onto the eyelets that are screwed to the terminals in the cup and the whole assembly comes together again in its aluminium cup. 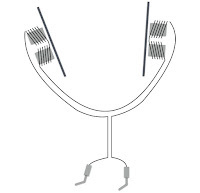 Carefully placing back the diaphragms (with gaskets) and screwing the earcups back on, the headphones then simply snap back into the forks of the headband. Making again a complete 1920s set of headphones that are now functioning fine. In the meantime; with a quick soldering of some sockets onto a 3.5mm jack the headphones can already be used with any modern music-player or phone. With the very high impedance of the headphones, the volume must of course be set high for a decent, still modest sound volume. The sound is a bit 'tinny' perhaps, but it does a very good job of reproducing the period music - voice comes through very crisp and clear. Also despite being relatively heavy and with hard earcups, they're not as uncomfortable as you'd perhaps expect. 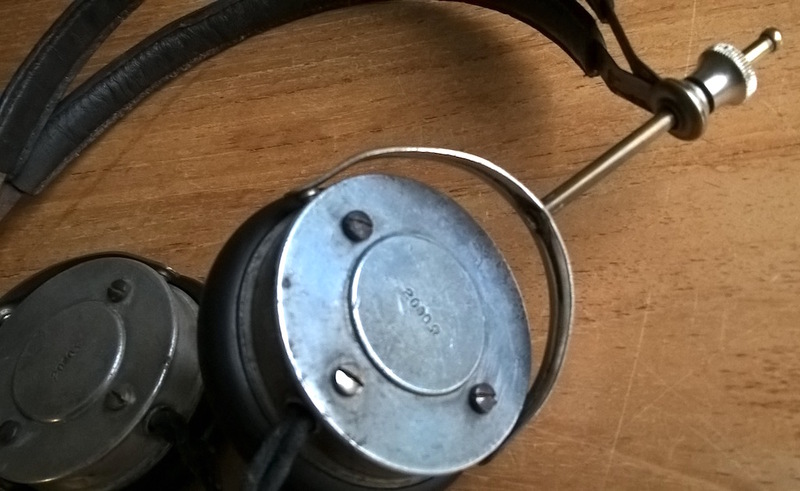 So not quite modern 'hi-fi', but surprisingly good headphones from the 1920s.